In case you’ve ever wondered how to spot a gaming convention I’ve come up with some easy steps. First, look for a convention center where the parking lot is packed and spilling into the overflow lot. Second, check out the license plates on the cars. 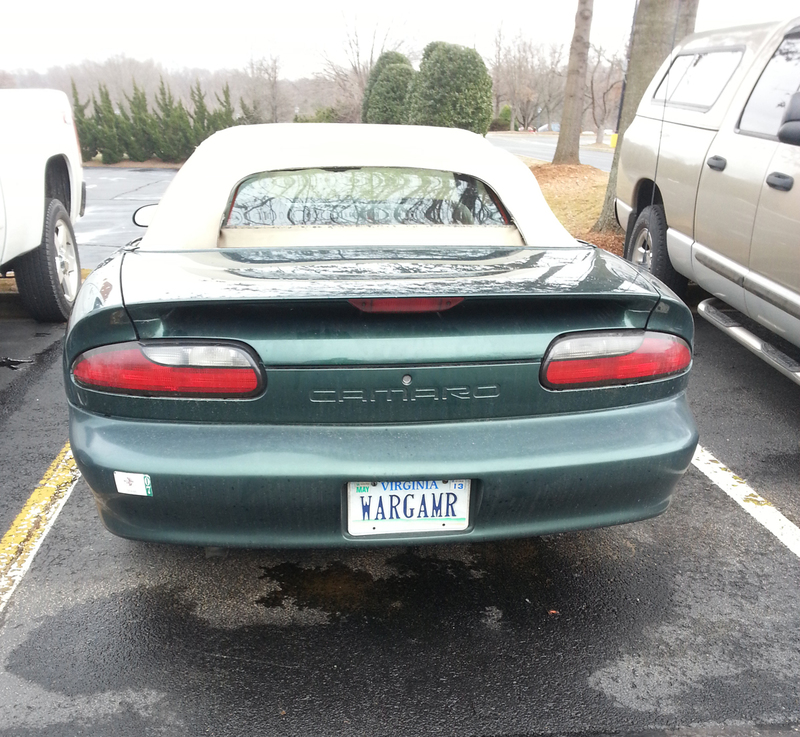 If they spell out “wargamer” “spieler” or some model of WWII tank you’re at a con. Yup, I found the gaming convention. That’s what I found as I entered the parking lot Friday afternoon. 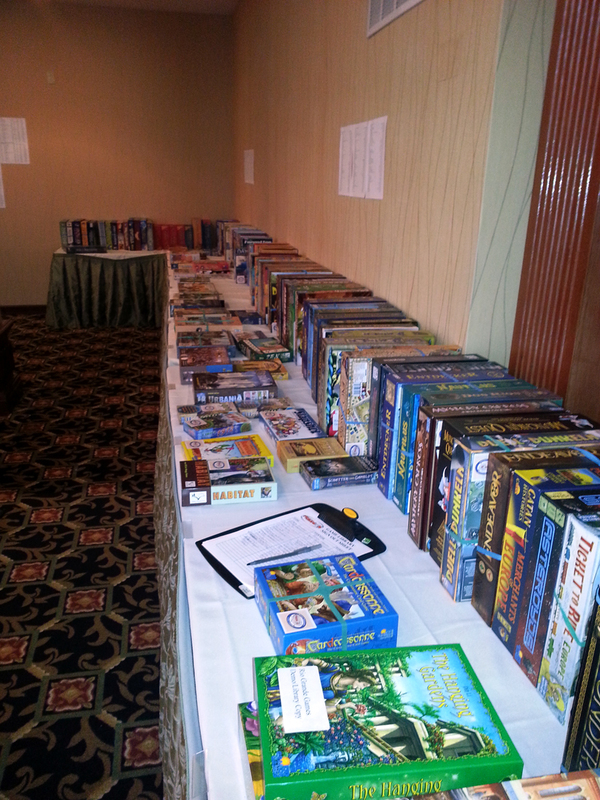 Entering the Double Tree Hotel In Charlottesville, VA I saw games splayed out on every horizontal surface. One of the great things about gaming conventions is learning about all the great games I’ve not had the chance to see or play. It’s not unusual for me to run across games I’m not familiar with – I can’t play them all. 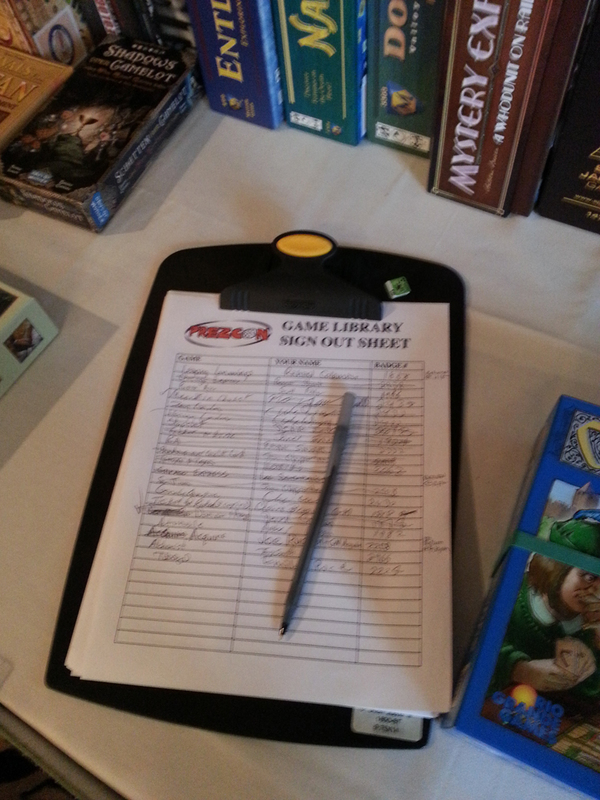 In addition, many games create either house rules or their own games for the sole purpose of playing by rules they find best. So it wasn’t a surprise that the first game I saw wasn’t one I recognized. Across the Pacific by Pacific Rim Publishing – the first thing I saw when I walked in the door. Not knowing about games isn’t my real problem – it’s resisting the urge to buy them. I can walk into a game store and typically make a Will save. Resisting the temptation to buy at a convention is far more difficult. Sure enough, over the course of two days I walked out with five games – just the minimum. Or so I thought. 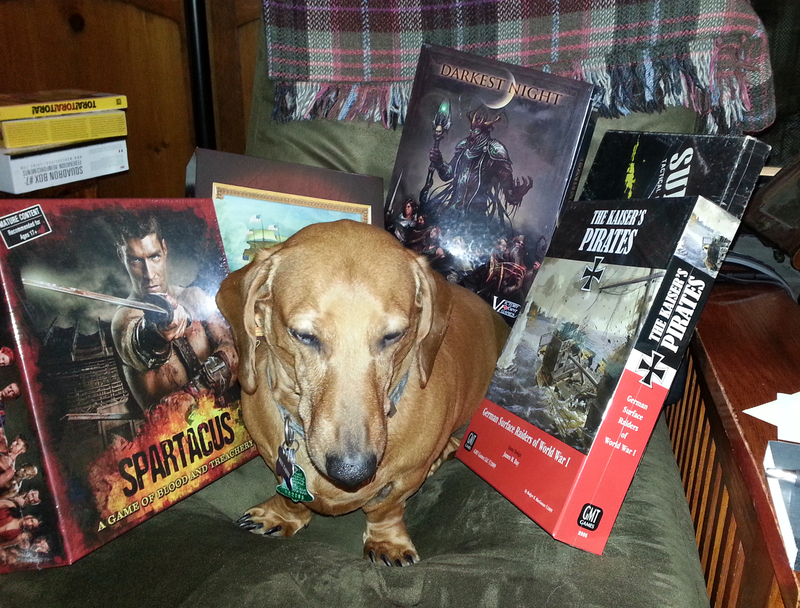 Kaiser Max has blitzed his daddy’s chair and seized the phat loot that scored at PrezCon. As of Saturday. 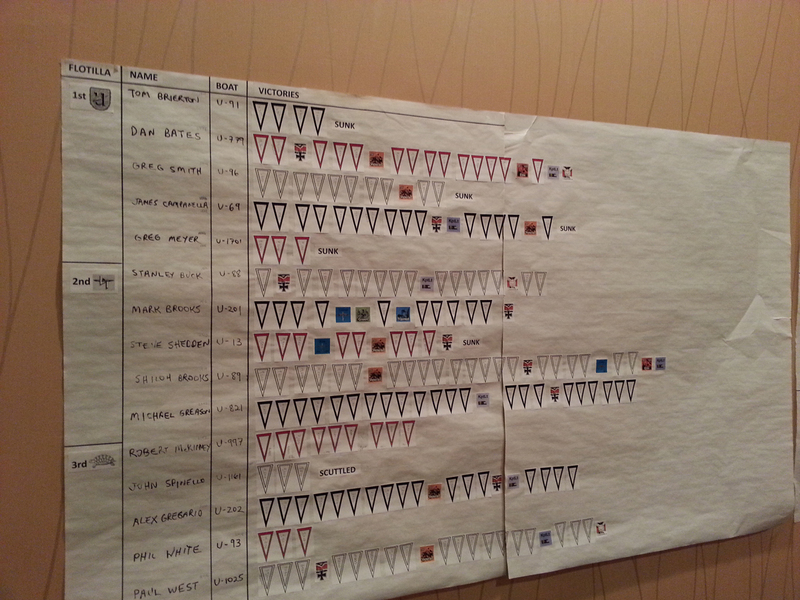 Sunday would see yet more games accumulated. Friday threatened to set the tone for my shopping habits. 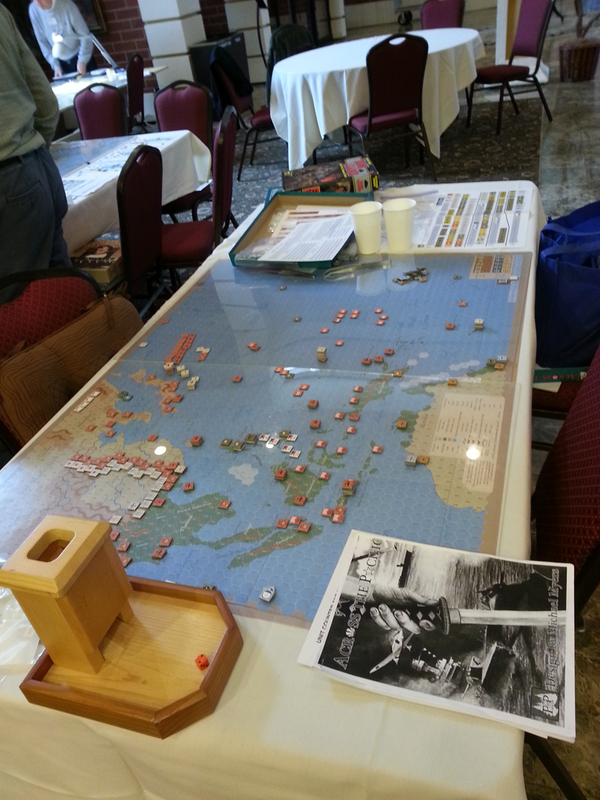 Seeing Across the Pacific must have planted a seed in my brain, as that afternoon I walked out of the vendor hall with two naval wargames, Battleline Publications’ 1976 game Submarine, and Worthington Games’ Naval War of 1812 (the 200th Anniversary Edition. I figured I likely wouldn’t be around for the 300th anniversary.). Happy as I was with those finds, I’m always looking for that one thing that sets a con apart. Bill Alderman provided the answer. His company, Big Board Games has built a better mousetrap. If you’re finding yourself going back to one great game time after time, Bill has something you’re going to need to see. 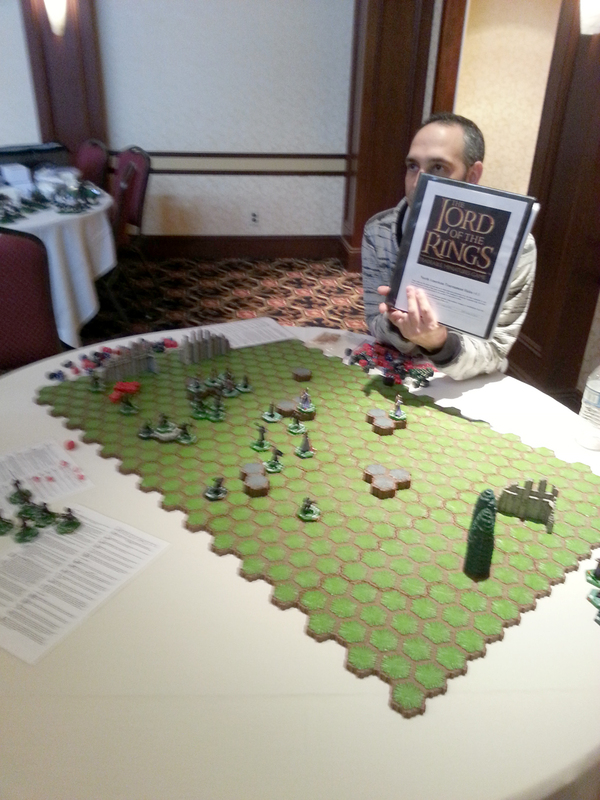 He has inked a deal with several board wargaming companies to reproduce oversized maps, counters, and charts. 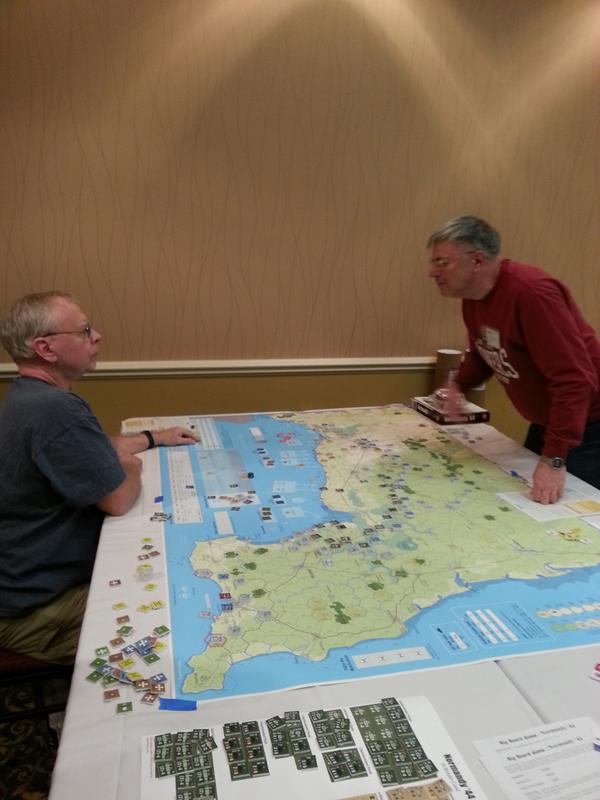 The image below is of GMT’s Normandy ’44. The map is four feet by six feet and consists of two sheets taped together. If you’re thinking that’s pretty cool, so was I. But wait, there’s more! These maps aren’t printed just on paper, they’re printed to be used…and used…and used. 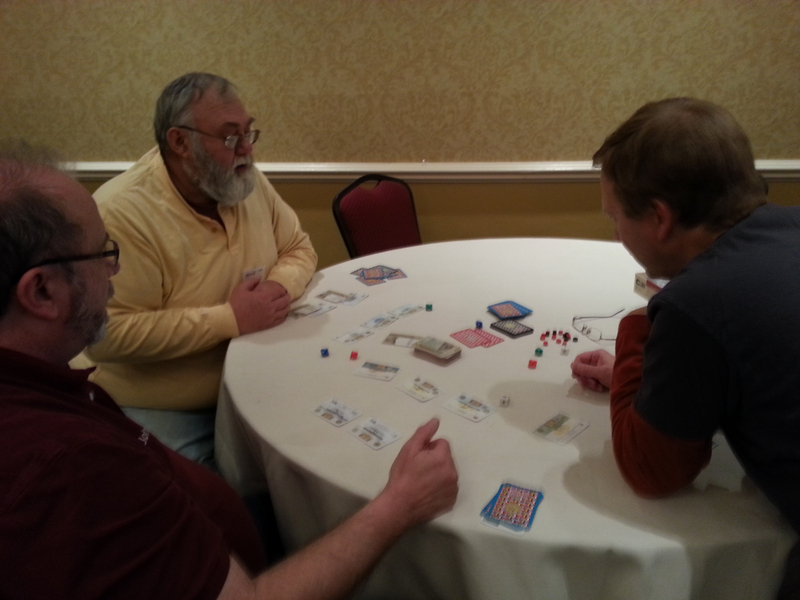 Bill prints his games on Tyvek – that same plastic material that is used to waterproof houses. He then coats them with a proprietary substance that ensures the maps are resistant to UV and fading. Maps can be printed in any size. Because of the methods used by modern game designers, vector printing allows the images to be scaled to almost any size. Bill has another great idea: the Normandy ’44 map is printed at four times the original scale, but he counters are printed at only three times. That gives the counters plenty of visibility but allows the underlying terrain to show through so it’s easy to see that a stack of units are sitting in an urban hex. The colors are vibrant and clear, printed at 600 dpi. Sheets are printed on a 42” printer, but it is possible to print on even larger ones, though frankly I had difficult seeing where the seam was on the Normandy ’44 map. This brilliance doesn’t come cheap. 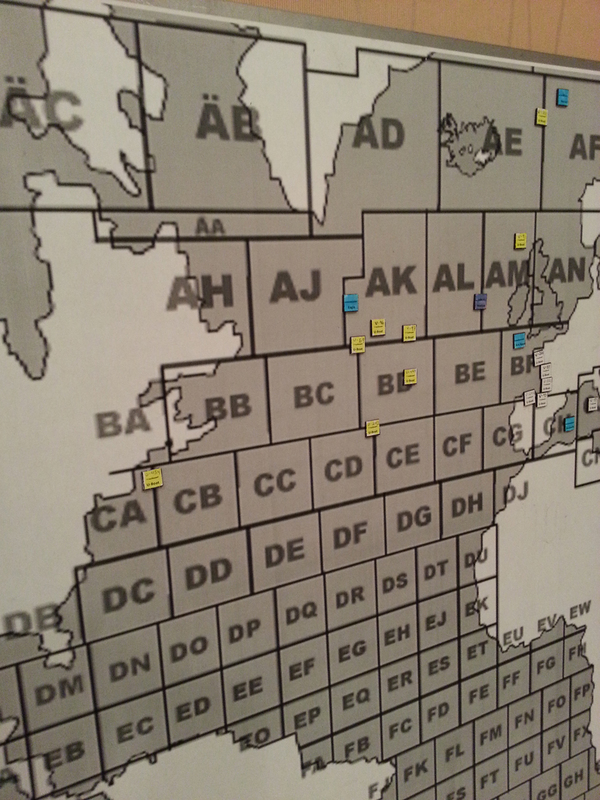 Unmounted 48” x 72” maps can run between $190 and $320. Mounted maps cost about $40 more. Counters are mounted on 1/8th inch Styrofoam board. As I said, this isn’t cheap, but maps can be printed for pretty much anything you can get an image for. I’m considering a star field background over hexes for my Federation Commander games. For games you love to turn to again and again I can’t imagine a better way to enjoy them. There were several stories related to gaming news. First, the good news was that PrezCon’s attendance was up about 10% over last year. 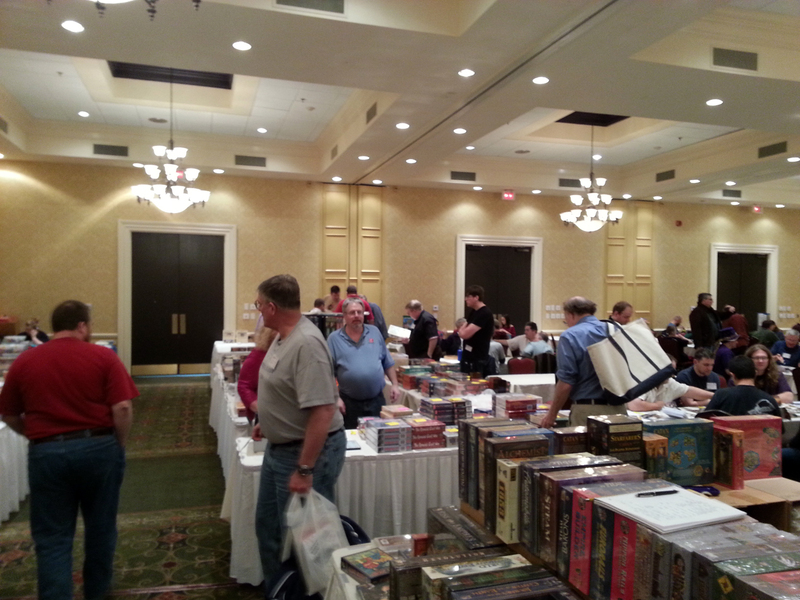 The hotel was packed, gamers were happy, and vendors were pleased with sales. I also got to chat about the guys from Gale Force 9, who just released their boardgame Spartacus, based on the Starz movie channel series of the same name. The game looks really good, and I bought a copy. Gale Force 9 has a convention special and gave me two extra gladiator cards for the game. These are high powered fighters and I’m looking forward to breaking out the game and using these extra pieces. Gale Force 9 is also working on an alpha playtest for a game based on the Firefly TV series. Word is that the alpha is already a big hit with the guys playing it and there are some big box retailers that have already committed to pre-ordering a whopping 15,000 copies. In boardgaming terms that’s huge and I think I can speak for all gamers when I say I can’t wait to see what they release. Columbia Games has some big news – they’ve just launched the 4th printing of Napoleon. This is being launched via Kickstarter and promises to be a five star edition. Gamers can expect bigger blocks (24mm), a deluxe mounted map, eight dice, and two copies of charts and rules printed in full color. As with all Kickstarter projects there are a variety of funding levels. At the highest level is a guided tour of the Waterloo battlefield with Tom Dalgliesh on the 200th anniversary of the battle in 2015. Sign up for the tour now as space is limited! Worthington Games also has some news that hasn’t been announced on their website yet. 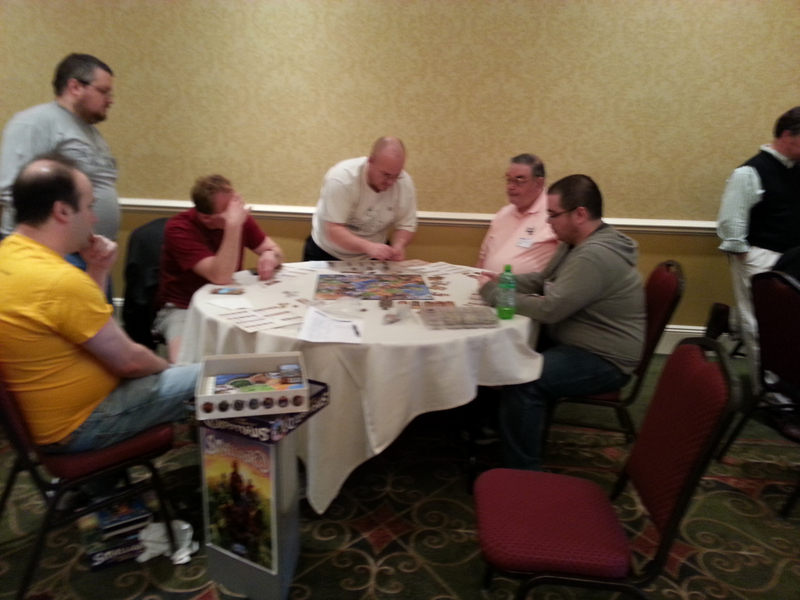 They are working on their next game, Frederick’s War, which is based on Worthington Games’ Hold the Line mechanics. It will include eight battles of Prussians versus Austrians. 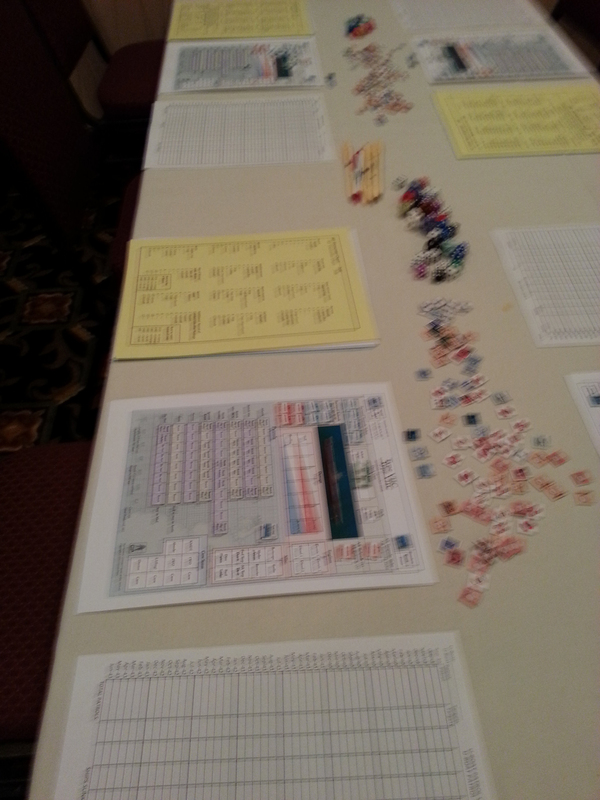 Also in the works is a medieval game, and there is word we may see a battle on Alesia in the near future. Stay tuned for more information as we get it. PrezCon was a blast this year. With attendance up and a healthy array of boardgames to choose from – along with the Winter Nationals for competitive boardgame play, I had a great time and can heartily recommend attending to anyone.